Donald Trump is preparing a novel campaign strategy for a president who’s pulling the U.S. from the international Paris accord on climate change, cheer-leading for coal, one of the dirtiest source of power, and suggesting that wind turbines cause cancer. He’s going to tout his environmental credentials. Administration officials are developing talking points on climate change and cultivating a list of environmental “success stories,” from cleaner air to reductions in greenhouse gas emissions, said a person familiar with the plans who asked not to be named describing internal deliberations. “President Trump believes you can grow the economy and protect the environment,” said Judd Deere, a deputy White House press secretary. In attempting to demonstrate that the U.S. is getting greener while still rolling back what Trump sees as job-killing constraints on industry, a key cheerleader may be Andrew Wheeler, administrator of the Environmental Protection Agency. But supporters say Trump has environmental achievements to celebrate too. Wheeler noted that from 1970 to 2017, conventional air pollution in the U.S. fell 73 percent, even as the economy grew more than 260 percent, Americans traveled more miles, and the U.S. used more energy. The Trump administration can also point to expanding use of natural gas, both domestically and exported overseas, where it can displace more carbon-intense energy sources. “That is a pretty substantial story that they can tell, not only about our decarbonizing in the U.S. power sector, but also globally, sharing those technologies around the world,” said Rich Powell, executive director of ClearPath Action, a group seeking to accelerate clean energy innovation. Considering current global warming, natural Gas is no more better than existing coal plants when the leakage rate is above 2% . Dr. Howarth’s estimate for average, full-cycle methane leakage rate from natural gas operations is 4.1%. A gas well remains a gas well, even when production is long ceased, the well is just being plugged. As shale gas exploration needs an ever growing amount of wells being drilled just to keep production flat, we will see a vast growth of the amount of gas wells. 5% of gas wells leak from day one. After 14 years, 50% of the wells are leaking. 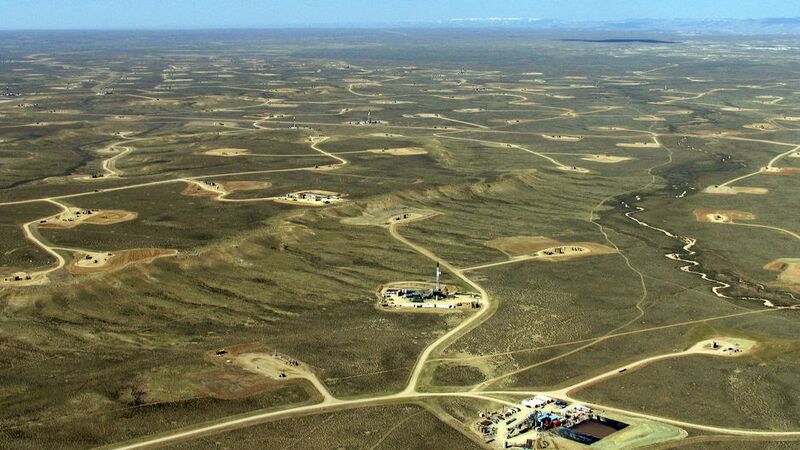 So it’s only a matter of time when methane will be released into the atmosphere from these gas wells. Fossil methane is 87 times as potent as CO2. The same applies to the methane called “by-product” at shale oil fields. Currently there are about 900,000 active oil and gas wells in the US. At the moment we can see a natural gas race all over the world. That’s why lobby groups want to sell gas as a so-called “bridge fuel” which would be better for the climate than other fossil fuels. But as we can see, natural gas only accelerates global warming. Natural gas as a “bridge” to a low carbon future has been debunked by the International Energy Agency, the UN Environmental Program and economists alike. For every coal-fired power plant converted to a natural gas co-generation plant, a return on the investment happens over a 25-30 year time period. The money that could have gone to the long-term truly low-carbon renewables — wind, solar, geothermal, biomass and small hydroelectric — stays with the devil we know. It’s like steadfastly eating red meat 24/7 — even though we know it’s not good for us — we just can’t seem to order that more healthy fish dish. Luckily the vast growth of fracking wells will be kept in check by the fact that the debt funding it will run out of morons to fuel it further as it becomes clear to more and more people that it is not profitable. I don’t think so. Despite the fact that at least half a trillion of $$$ have been burnt in the last six or so years they still keep on drilling. Now Trump et al are pressurising Europe to buy US LNG. Europe is building new LNG terminals despite the fact that we need to reduce GHG emissions. There is a natural gas race going on. And the shills are successfully lobbying EU politicians with arguments like “bridge fuel” and “security of supply”. All bonkers. We need less fossil fuels, not additional new natural gas infrastructure. This must be Straw Man day on Crock. Nationally, fracking produces two-thirds (67 percent) of the natural gas in the United States, according to the US Energy Information Administration, and approximately 50 percent of the nation’s oil. It’s not the fracking that matters, it’s the fact that we keep drilling for gas and oil PERIOD—and burning them, and mining and burning COAL. Production and consumption numbers of all fossil fuels are going up—who cares whether it comes from fracking or Granny is skimming it off the puddle in the back yard or out of a pipe she stuck in the ground?. Two good pieces about fracking oil and gas. No straw man at all. Fracking is far more invasive, requires far more drilling sites and releases far more methane into the atmosphere than conventional oil and gas exploration. I agree, we have to stop any fossil fuel extraction ASAP, but shale gas and oil are as bad as tar sands if not worse. Same applies to coal seem gas which is mainly produced in Australia. Maybe you missed my point or I wasn’t clear. Fracking IS as bad as you say, but the HUGE elephant in the room (besides our fat-assed fake president), is still the very slow decline in the burning of fossil fuels. I would also dispute that fracked oil or gas is worse than tar sands on a barrel per barrel basis—-got any figures on that? Please watch the video I posted in the OP and read the article linked above. Shale gas exploration is releasing more than 40% more methane into the atmosphere than conventional exploration. I think this is significant. Methane is a greenhouse gas that is 87 times as potent as CO2. I don’t need to watch the video or read more articles or be told that methane is a potent GHG. I’ve studied the issue for years and read whole books about it. Yes, its release from drilling, fracking, and refining IS a worry, but the warming caused by burning fossil fuels may soon push us past the tipping points that will cause the release of large quantities of methane from subsea clathrates and permafrost, and that will make leaks from fracking look like a small burp. BTW, here’s a good site with info on methane hydrates and methane. Like Shale Gas Ireland, it has been inactive for a while, but it has lots of good info. Also consider the lower Energy Return On Investment (EROI) for shale gas and oil and you see why I come to this assumption that shale gas/oil is as bad as tar sands. Most unconventional energy sources have much lower efficiencies than conventional gas and oil, which operate at a combined energy-returned-on-investment ratio of about 18:1. Shale gas, for example, performs at about 6.5:1 to 7.6:1—a bit better than the 2.9:1 to 5.1 for tar sands oil. Corn ethanol, with an EROI of about 1.3:1, sits at the bottom of the barrel for investment pay off. Irrelevant. It’s not economics and EROI that matters but that tar sands are the dirtiest fuel on earth in all ways—extraction, refining, burning—-compared to oil, natural gas, and even coal. In energy economics and ecological energetics, energy returned on energy invested (EROEI or ERoEI), or energy return on investment (EROI), is the ratio of the amount of usable energy (the exergy) delivered from a particular energy resource to the amount of exergy used to obtain that energy resource. “… in that gorgeous image. 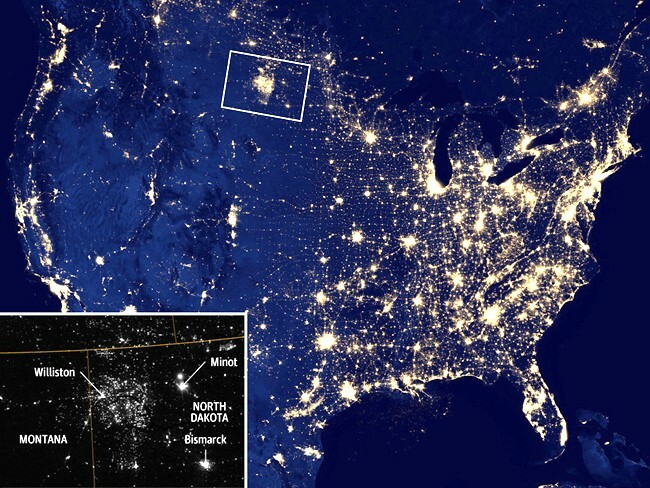 The city lights of the United States are below, to the south, with the Great Lakes made obvious by their lack of light. … Dominating the view, even surpassing the vast waters of the Hudson Bay, is the aurora borealis … And then my eye wandered west, and I saw a weird clumpy glow … and I knew immediately where and what it was.